Bamboo Fly Rod building and the hardware used to build the Classic Bamboo Fly Rod.
. E-Mail: Bamboosfly@Aol.Com ............Bamboo Fly Rods Made to Order & Repaired. Bootin' Rayz Outdoors . . The Planing Form is made from two 60" long bars of 3/4" square cold rolled steel, placed side by side. 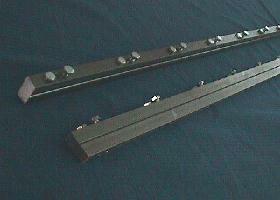 They are doweled together using 1/4" hardened round steel dowels. The dowels are placed at each end and on 10" centers. The dowels are placed to ensure that the forms will open and close on the same plane each time. 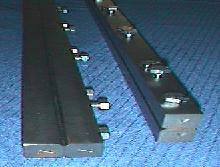 The adjustment of the form is made by 3/8" S.S. Bolts, set in pairs on 5" centers. One bolt is threaded so it can push the form open, and the other bolt is threaded so it can pull the form closed. An experienced person should be able to adjust the taper on one grove in ten to fifteen minutes at the most. The bolts use a 1/2" socket to adjust or turn. Every care has been taken to ensure that the bars are set level before doweling. It is advised that the user assure that the dial indicator used to set the taper is resting on a smooth surface. $425.00 (US) each, plus S & H .
Two 60 Degree Grooves - Length--60"
There are two tapers cut into the machineline of the two bars. One for Tips, and the other for Butts. The small taper is cut .028" deep at one end and goes to .080" at the other. The large taper is .080" deep at one end and goes to .150" at the other. The taper is a 60 degree grove, and the cut is milled with the bars held tightly together, so minor variations are taken care of when the taper is adjusted. The bars can be adjusted by opening to fit almost any taper. The grove is set at one half the desired thickness of the finished rod, or D/2. Six strips must be planed on the same taper to make one rod section. The grove depth is altered by adjusting the set screws. Depth adjustment is started at the smallest acceptable D/2 grove and widened at the 5" bolt spacing to the required taper.